Jan's stoneware pieces reflect her love of utilitarian ware. Her goal is to produce affordable, utilitarian stoneware items to be used and savored in our everyday lives...sipping our morning coffee or tea, cooking and serving our meals or arranging the flowers freshly-picked from our gardens. We slow our pace a bit and comfortably cradle the warm cup in our cold hands, or savor the bubbling casserole that invites us to a meal which sustains our souls as well as our bodies. These containers that reflect the fingers that lovingly formed them, make rituals out of everyday events. 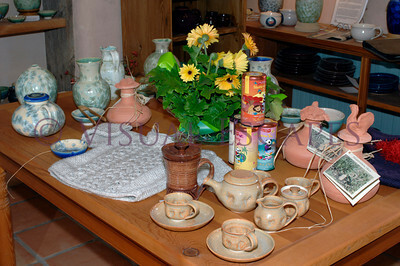 The stoneware is formed by hand on the spinning potter's wheel. 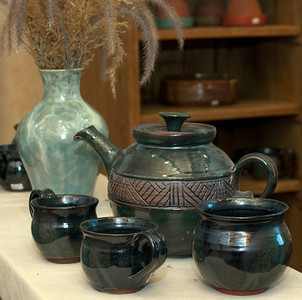 Jan has been "throwing" pots for over 40 years and loves the process even more than the product. In the contemplative manner of a true production potter, she spends hours at her wheel creating pots nearly identical, yet each uniquely individual. Row upon row of mugs, bowls and vases can be seen lined up in her studio in various stages of production. After drying to the leather-hard stage, each piece is trimmed and, if necessary, hand-carved in the unique Iroquois motif. After drying thoroughly, the pots are then places in the kiln and fired to bisque temperature, hardening them to allow for easier glazing. Once glazed, they are fired again at 2165°F to produce the durable, oven-proof, dishwasher-safe glazed finish. Crystalling tea pots, stoneware ollas, miniature tea sets and knitted sweaters. Just a sample of some of Jan's work. 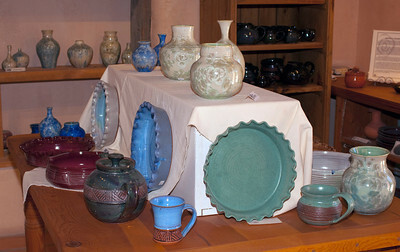 Jan is well-known for her complete place settings of stoneware. The place- settings are unique both for their design and for the fact that Jan can produce any piece that you'd like to have and in a myriad of colors and sizes...dinner plates, luncheon plates, saucers, cups and or mugs, soup/salad bowls, serving bowls, goblets...even covered casseroles and sets of canisters to match the tableware set!